She is one of Zen's close Aides and an excellent swordsman. Her partner is Mitsuhide whom she likes to tease. 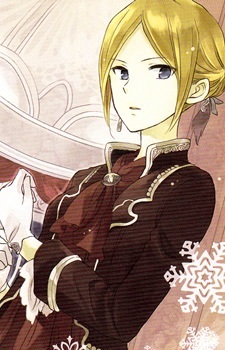 Both she and Mitsuhide notice Zen's shyness and interest in Shirayuki which they approve and support. She is cold and stern towards troublemakers and triflers but is kind to the people she respects. Later on in the story, Kiki reveals that she made an agreement with Zen to become his aide for a short 6 years before returning home to take over as head of the Seiran household. Kiki tells Mitsuhide she has one year left at the Wistal castle. This puts her at odds with Mitsuhide, feeling betrayed because both Zen and Kiki kept it secret from him. Kiki explains why she did not initially tell Mitsuhide and why it got harder as she dragged it on. Kiki reflects on her past, how she met both Zen and Mitsuhide, realizing there are reliable people in the world, and her agreement with her father to serve at the castle. After sparring a bit with Mitsuhide, he asks Kiki to stay a little longer to support Zen and Shirayuki. Kiki goes to Zen and asks if he wishes to make Shirayuki his queen. Zen replies that he does. Seeing his determination, she asks Mitsuhide to come with her to confront her father about canceling the agreement. Her father initially is against it, remarking on how many duties the head will have to oversee and the time it will take to learn them, but seeing that Kiki is serious about staying at the castle, he relents and allows her to stay until Zen has accomplished his dream. After these events she cuts off her ponytail. It shocks her friends but Kiki explains she did it of her own free will.